You are here: Home » News » Birthday Girl! Birthdays are thought of differently by everyone depending on what age you are. When we are born, we’re basically oblivious to the event, except for the slap on the back side we were given by the doctor. At ages one and two years, we realize something is going on when our parents stick a cake on our high chairs wanting us to dig in and make a mess so they can show us how silly we looked from the pictures they took when we got older. From then on, we realized that birthdays are events that happen when we get presents and look forward to them each year. After a certain age, it’s not the presents so much that we look forward to birthdays as it is wanting to be older. How many of us remember our parents telling us we can’t do something because we’re too little or too young. “Wait till you’re older,” mom would say. The first age we are anxious to reach is age sixteen! Perfume and gasoline are two combinations that draw teens to that magical age. Perfume, because we are finally allowed to date, and gasoline, because Dad bought us our first car so we could drive to our first after-school job (actually my dad picked my car out, but I had to make the payment). Between the ages of seventeen and nineteen are the next birthdays we look forward to. That means senior prom and graduating from high school. We are primed and ready to go out into the working world, possibly college and moving out of our parents house. Some of us are finally on our own and become the founder of our own destinies without having to seek permission from our loving parents. Little do we realize that being out on our own sometimes isn’t what it’s cracked up to be; namely rent, utilities, groceries, insurance, etc. Twenty-one is the next magic age. We are now what people call legal. The bar is open! After several years of what we consider the perfect ages, then everything starts to go down hill as far as birthdays are concerned. In the song Tennessee Ernie Ford wrote called, Sixteen Tons, the line that says, “Another day older and deeper in debt…” states our general situation. For some people the tears start after the age of thirty. Between working, marriage, raising kids, keeping up with the bills, we go oblivious to the pleasure of birthdays and then at age thirty-nine — birthdays end! Many people turn a blind eye to age — dare I say it — FORTY! I know a few of you just cringed. Well, I’m eighteen years passed the age of forty. For those of you who don’t want to do the math, I turned fifty-eight, April 24th. Most people don’t like to tell their age and some even lie about it. But those people who lie, they generally say they are younger than what they really are. When you give the fictitious age, the person you told might think, Yeah, right! They then roll their eye and know you fibbed because you look older than what you said. Me, I have no qualms about telling my age. I tell it like it is, and I generally get compliments. Many have said, “You don’t look it!” So by telling the truth, I get a compliment (but then, they could just be being polite). My next big hurdle is the big 6-0! That’s the next decade people start looking forward to birthdays again. The word is — retirement age! Now, you may wonder, why am I going on about birthdays, and what is this picture I have attached. Well, this was a birthday present I received from my sister, Tina. 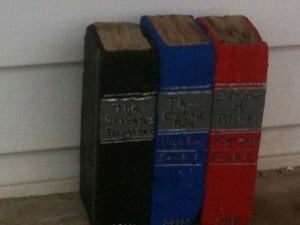 They are three old brick she painted to represent three of the books I’ve written. So, this is why I am going on about the b-day. I’d like to thank my sister for her thoughtfulness and compliment her on her crafty-hand.